Bonding is the creation of an intense attachment between a child and their parents and is essential for babies health and wellbeing. Although studies are still being conducted, science has shown that a child’s bond with parents does influence their sense of security and self-esteem as they grow and develop. 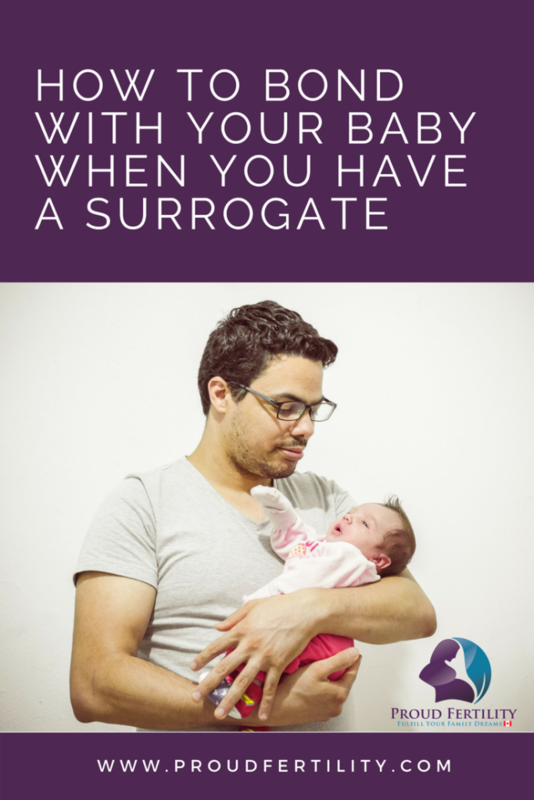 However, a bond isn’t created overnight, but over time, and can even begin before the baby is born – so what can you do if you’re not carrying your own child? Even in the womb, babies can hear sounds and movement around them. Starting early, during pregnancy, is one way to interact with baby before they’re even earthside! Record your voices reading a favourite childhood story or singing a nursery song, choose favourite songs for baby to listen to in the womb, or talk to baby via skype or in-person time spent with the surrogate. Baby’s sense of smell is also strong. One surrogacy family chose to ask their gestational surrogate to sleep with a stuffed animal regularly. When it came time for baby to transition to her parents, she had the scent of her surrogate for comfort. Of course, after baby arrives, the ways you can bond grows! So what can Intended Parents do after birth? First and foremost, skin-to-skin time! An Israeli study conducted long-term on NICU (Neonatal Intensive Care Unit) babies have shown that consistent skin-to-skin care (otherwise known as ‘Kangaroo Care’) provides benefits such as improved organ function, stabilization of body temperature, exposure to good bacteria, and reduction in crying and pain. You help provide baby with a warm, safe place to experience their new environment. Bonding also develops during the simple tasks of day to day care; feeding, changing diapers, comforting, speaking to, bathing, and holding your child will assist in forging a strong and loving connection. Remember to be fun! Make faces, sing songs, speak in silly voices – as baby grows, they will love the interaction and learning. Your child’s first smile will expand your heart even more than you thought possible. Guest Blog: Doulas Are For Intended Parents, Too!